Dear Linda Harrison is a play based on the National Shoppers Survey. Each question of the survey asks for a multiple choice, tick box answer. As the characters in the play respond to the questions, they in effect place themselves within one of a series of limited or fixed options, creating a flawed consumer self portrait. Each time the play is presented the actors should respond honestly and personally to the questions in the survey, so the play itself has no fixed script or duration. 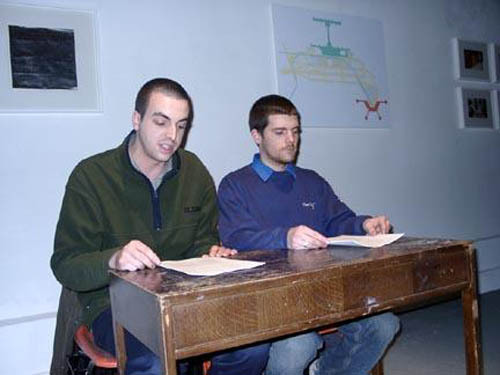 Dear Linda Harrison was first performed by Andrew Miller and Duncan McAfee at Studio Voltaire, London. Click here to request more information or purchase script/digitally-recorded performance (please specify preferred format; VHS or DVD).